This is a beautiful and varied gravel grinder ride starting and finishing in Patagonia. The first half rides through wide open prairies where you can imagine Western Movies being made. The second part follows back along the edge if the hills, with more trees, more hills and more twisting road. We did the loop clockwise. The loop is about 48.4 miles with 2,750 feet of climbing. 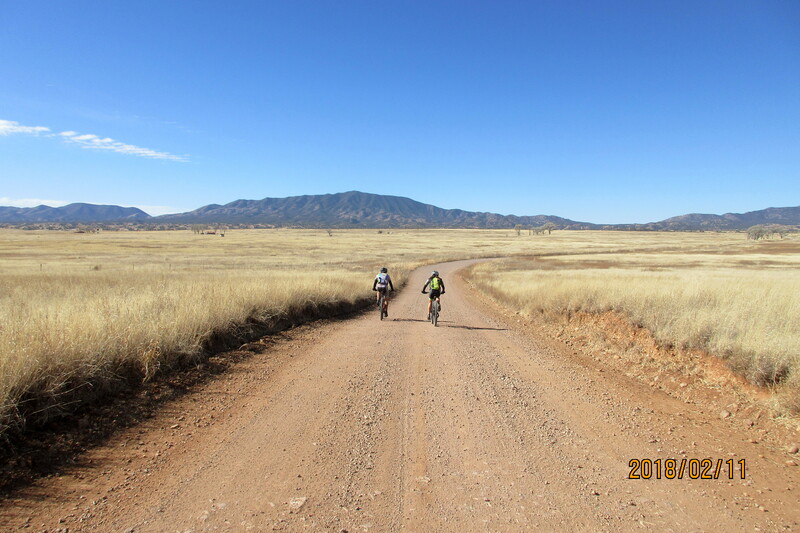 About 10 miles of the ride are paved and the other 38 are on generally well graded gravel. It’s an easier ride than the other great gravel ride around Tucson – Redington Road Over-and-Back, which has 48 miles of rolling dirt road. From I-10 drive down Highway 83 towards Sonoita. Turn right in Sonoita on Highway 82 to Patagonia, which you’ll reach in about 38 miles from the I-10 exit. Once in Patagonia, turn left onto the parallel street that has all the stores and the parking. Park near the Patagonia Cafe. There’s a public bathroom to the south. Head north-east on the road you have parked on (Harshaw Road) as it curves right and heads east. The first few miles are paved, then at mile 3.2 the road splits, with the paved road on the right and a dirt road on the left. Take the left fork and follow the dirt road (Harshaw Creek Road) for about 4 miles until at mile 7.3 you reach a T-junction. Turn left (Patagonia-San Rafael Road). 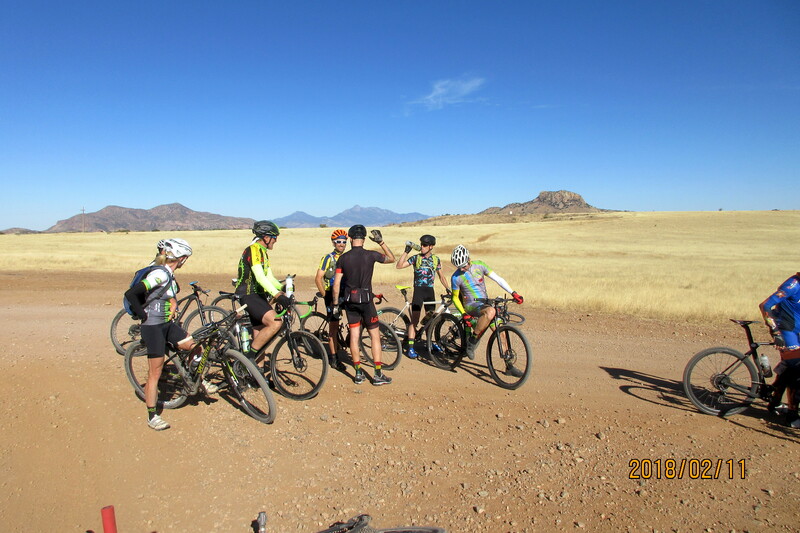 Follow the road left for 4 miles and eventually you’ll climb a good hill, reaching the top at mile 11.3 and you will be greeted by incredible views of wide open prairie, where you can imagine buffaloes roaming, and stagecoaches being chased by Indians on horseback. We regrouped here. You’ll see a sign for Lochiel in 13 miles. Lochiel is your first destination and you’ll follow the signs to Lochiel at all intersections. So, at mile 14.9 follow the road round to the right. At mile 20.8, just where the hill rears up, turn right. At mile 22.7 at the Stop sign and T-Junction, turn right. 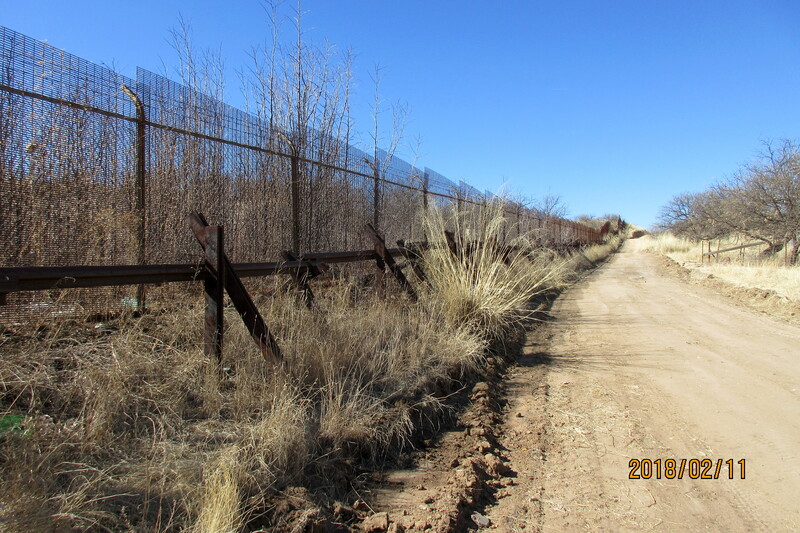 Instead, you follow the main road as it curves round to the right, signed to Nogales. You are now on the homeward run and the terrain will be very different: more trees, more rolling terrain, more twisty roads. 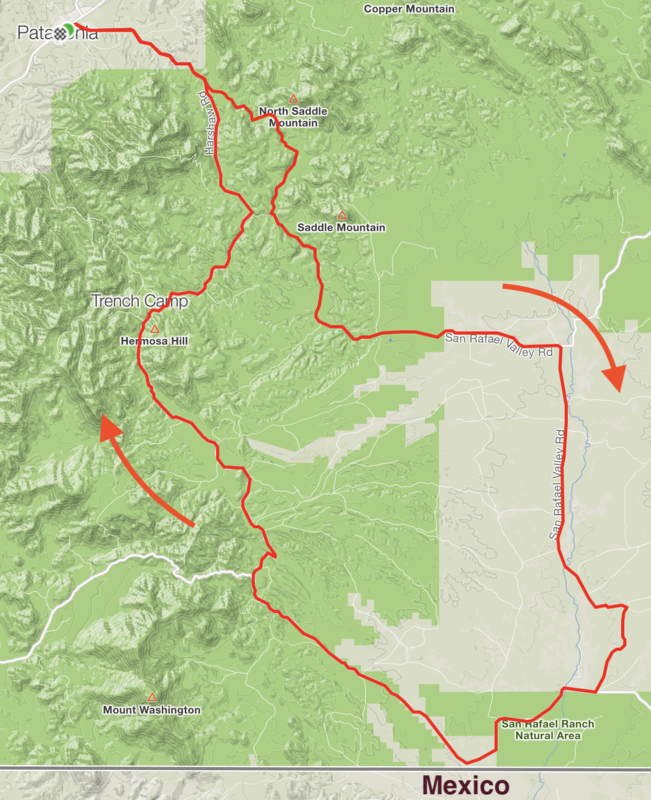 At mile 32, at the top of a hill, the road forks, with the left fork signed to Nogales and the right fork to Patagonia. Take the right fork down a lovely fast downhill, followed by the longest, steepest, hardest climb on the ride, reaching the top at mile 33.3. The next 3 miles roll, with lots of ups and downs, then at mile 36.5 you reach the top of the final climb. The next few miles are mainly downhill, sometimes fast and bumpy, until at mile 42.3 you reach a Stop sign and T-Junction, with a sign saying 6 miles to Patagonia to the left. You are now on paved road for the rest of the way back to Patagonia, which is a relief after the fast bone-jarring descent you’ve just done. You enter Patagonia on the same road you left.